Frisner Augustin was a native of Port-au-Prince, Haiti. His father, Julien Augustin, was an itinerant carpenter. Most of the time his mother, Andrea Laguerre, and her mother, Rose Laguerre, raised him. Frisner's mother occasionally produced industrial crafts and tourist items; at other times she was unemployed, and the family struggled to survive. His family could not afford to send him to school. When he was a young boy, his uncle played drums and traveled throughout the Caribbean. Growing up, Augustin admired his uncle and wanted to become a drummer himself, hoping to earn enough money to help his mother and sister out of poverty. His father sent him to welding school to learn a trade. "But anytime I go to my job, my school for welding," Augustin recalled, "I think about drumming. When I'm on the street, I clap my hands and sing.... Sometimes I'm on the job. I put some pieces together with a torch, and I keep thinking about my drumming." After years of watching his uncle, Augustin decided to ask one of the other drummers at a traditional Vodou ceremony if he could participate. "I ask one of the guys, 'Can I do something?' And I'm afraid to ask him that, because he's bigger than me. He says, 'Frisner, can you do it? You think you can do it?' I say, 'Well, let me try.' I talk like that because I'm scared. This guy gives me the ogan. I play it, and I see that the guy doesn't take it away from me. He still lets me play. And I say to myself, 'I'm good.'" This began Augustin's apprenticeship period, during which he perfected his timing. After playing the ogan for a while, he moved on to the boula (ostinato drum) and then the segon (second drum). 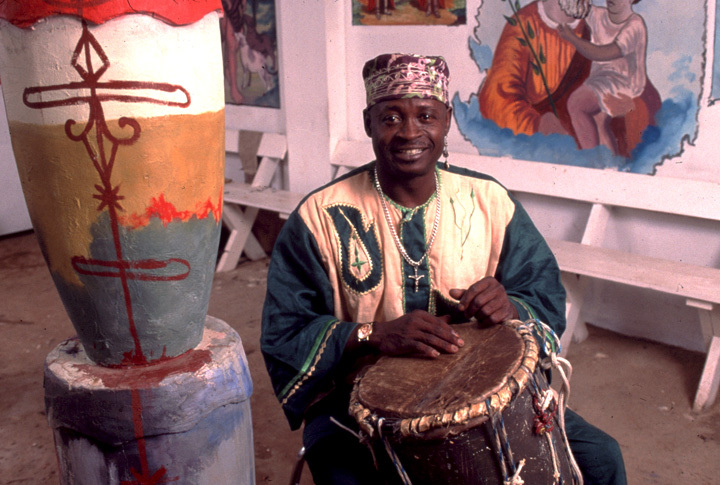 Augustin believes Ogou, the master spirit of the Vodou ceremony, was guiding his drumming. In a relatively short time, he learned to play everything needed for the Vodou ceremonies and was ready to advance to the maman, the master or lead drum. He was then only 10 or 11, unusually young to play lead drum. "They had to put me in the chair," he said, "and put a rope around the chair to hold me and the drum up." “Vodou” means spirit or family of spirits. Devotees of the religion revere more than 100 spirits, each with its own persona that requires appropriate drum rhythms, music and dances. Master drummers, therefore, must be familiar with the particular characteristics of each spirit in order to drum appropriately. 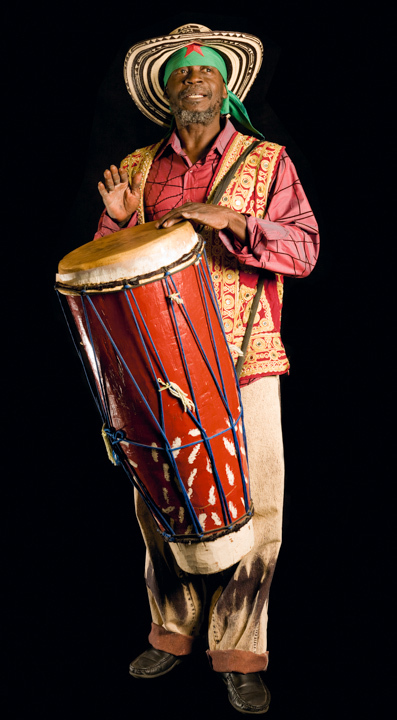 As an apprentice maman drummer, Augustin had to go through an initiation ceremony that prepared him for the responsibilities of "making the drum talk." The first drum he received was a burned-out mahogany shell onto which he had to attach a drum head. Putting the head on a drum is a ritual "presided over by the spirits." A shaved, wet goat or cow skin is placed over the wooden shell and allowed to dry overnight. The next day the skin is tied and tightened around wooden pegs, and holes are cut into the drum body. Through this initiation ceremony the drummer communicates with the spirits. Concurrent with his participation in Vodou ceremonies, Augustin continued attending welding school and was able to help support his family. 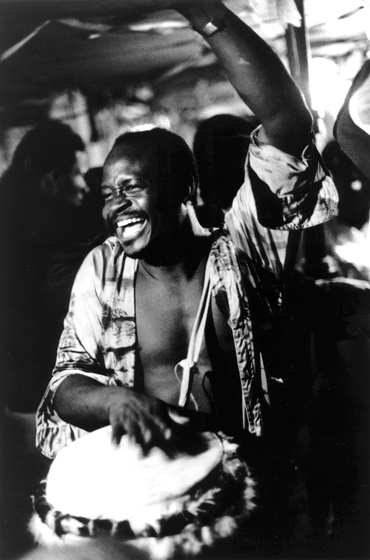 In 1961, he was invited to join a drum troupe traveling to Puerto Rico and began earning his living from drumming. After several years playing in theaters and tourist venues in Port-au-Prince and throughout the Caribbean, he immigrated to New York City in 1972. There he played for newly established folkloric companies and established himself as a drum teacher. 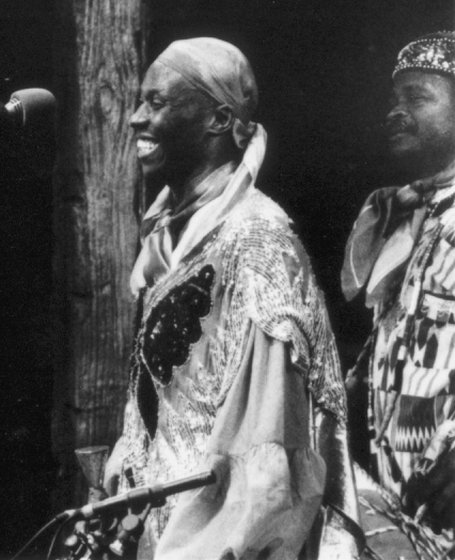 In 1981 he took over the direction of the folkloric dance and drum company La Troupe Makandal upon its arrival in New York from Port-au-Prince. The troupe has performed Afro-Haitian music and dance throughout North America. 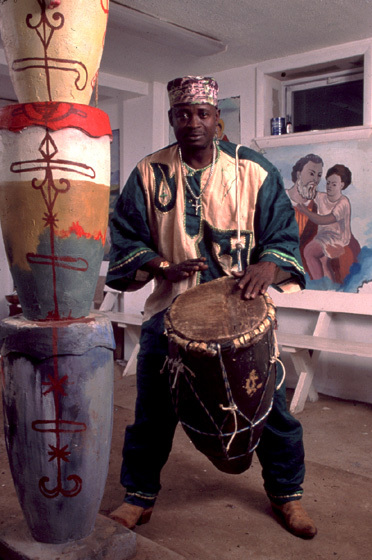 Augustin also taught drumming and "brings down the spirit" at Vodou rituals. 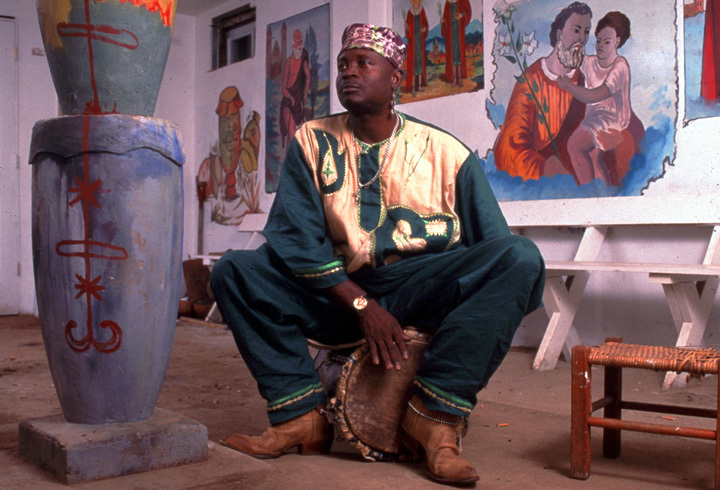 One of his objectives in teaching was to dispel the negative stereotypes of the Vodou religion. Augustin was involved in relief efforts for Haiti after the devastating 2010 earthquake. Jacobson, Mark. "Hear My Ear." Esquire (January 1996): 21. Ridgeway, James, and Jean Jean-Pierre. "Heartbeats of Vodou: Haitian Drums Call from Port-au-Prince to Brooklyn." Natural History (December 1998/January 1999), 107, 10: 30. Wadler, Joyce. "An Urban Hero, Captive to the Drums." New York Times (November 17, 1998): B2. Wilcken, Lois. 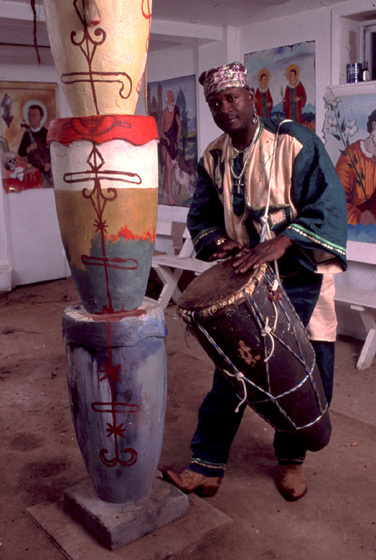 The Drums of Vodou. Tempe, Arizona: White Cliffs Media Company, 1992. Augustin, Frisner. 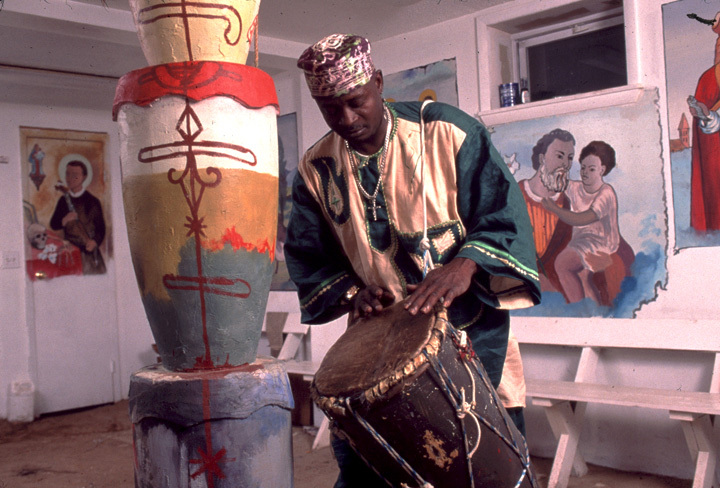 Rhythms of Rapture: Sacred Musics of Haitian Vodou. Smithsonian Folkways 40464. Augustin, Frisner, and La Troupe Makandal. Erzili. World Music Institute WMI-109.